McTimoney Chiropractic is a precise, whole body approach to Chiropractic care, it is suitable for all ages and is effective in alleviating some; back and neck pain, shoulder and knee pain, sciatica, minor sports injuries, arthritic pain, preventing migraines and much more (a full list of conditions can be located at the Advertising Standards Agency (ASA) website). UK members of the McTimoney Chiropractic Association are registered with the General Chiropractic Council. We work closely with other allied health professionals and if we feel your problem is not suitable for Chiropractic care or needs further investigation, we will liaise with your GP and other health care providers to arrange an appropriate referral, provided you give us your permission to do so. Anna is a Chiropractor who utilises the McTimoney technique and enjoys seeing a range of patients of all ages and varied backgrounds. Anna embraces the McTimoney approach as the holistic nature of treatment resonates with her. 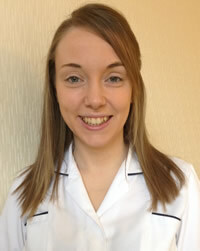 Anna works in Knaresborough on a Monday and Tuesday. Chiropractic has helped Anna over the years with various health challenges and she now regularly has maintenance treatments in order to ensure optimum function in order to help as any people as possible. After 5 years of study, Anna has a Masters in Chiropractic from the McTimoney College of Chiropractic in Oxfordshire. She is registered with the General Chiropractic Council (04808), is a member of the McTimoney Chiropractic Association and The Royal College of Chiropractors. Anna embraces a natural and holistic approach to life and enjoys keeping fit and healthy. In her spare time, she can be seen out with her dog, runs a Girlguiding Rainbow Unit and enjoys cooking and the outdoors. Of course, any advice Anna gives to you, she follows herself, this includes exercising daily, eating and drinking a healthy balanced nutritional diet and having regular Chiropractic adjustments. Anna is always keen to further her knowledge and skills through regular attendance at Regional and National Continued Professional Development events, workshops and technique seminars to update and develop her Chiropractic knowledge.